Fadia Faqir is a national pride. She is one of the most successful Jordanian authors (if not the most). Her books were published in 19 countries and translated into 15 languages. She already has four published novels. 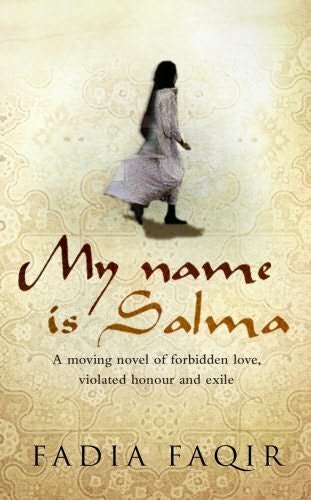 “My Name is Salma”, which is perhaps the most known, and “Pillars of Salt” which got translated into fifteen languages. 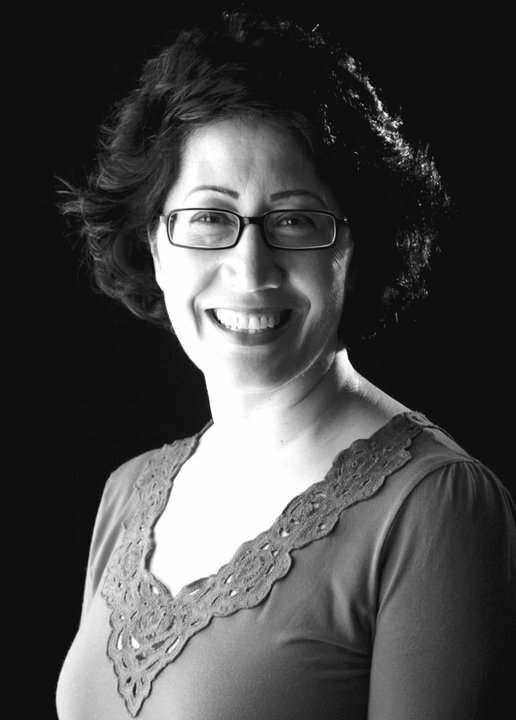 In her writings we could see a needed close-up on the lives of Jordanian women. Stories she managed to bring out of this small country and echo to the world. I read her latest book “Willow Trees Don’t Weep” recently and was impressed with how well she managed to craft the storyline. This shouldn’t come as a surprise since she holds a Ph.D. in Creative and Critical Writing from The University of East Anglia and have been teaching that discipline at the University of Durham for many years now. The book tells a story of a Jordanian young girl who goes on a mission to find her father who left home a long time ago to join the jihad fighters in Afghanistan. While the underline theme is a personal relationship between a father and his daughter, the book’s concern is much larger; it gives a needed perspective on the ramifications of the Soviet Union’s invasion of Afghanistan and its effects on our lives today. It shows the aftermath of the cold war and how it triggered the radicalisation of Arab societies. It takes us from Jordan to Afghanistan to the UK on a journey that depicts the lives of three nations affected by terrorism. Fadi: When I first started reading the book, I was instantly hooked. It felt like another book of Khaled Al Husseini who is one of my favorite writers. Was it an intentional decision you made to follow his writing style? Were you influenced by his books? Or is it the way you crafted the book with such quality, following modern standards of storytelling that made it feel like Khaled’s books? 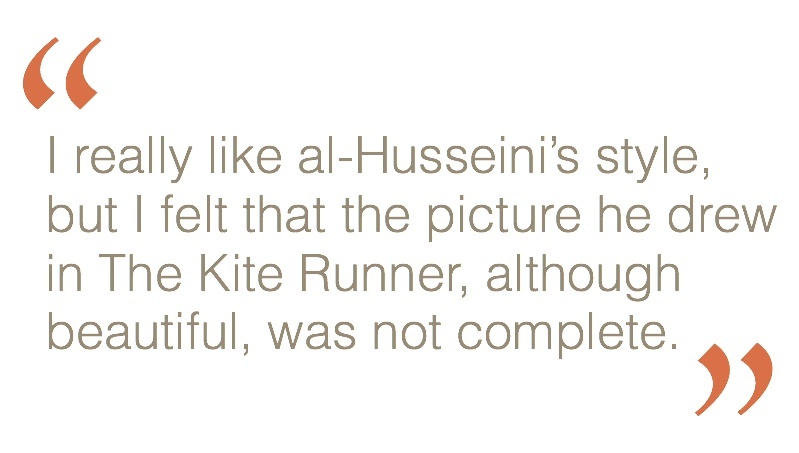 Fadia: I really like al-Husseini’s style, but I felt that the picture he drew in The Kite Runner, although beautiful, was not complete. Where were the so called ‘Arab Afghans’, jihadis from different parts of the Arab World, who joined the Taliban and fought against the Russians? Also if you look carefully my stance, perspective and vision are quite different from his. I don’t see the American invasion of Afghanistan as a liberation. It is simply an occupation and didn’t improve living conditions for ordinary Afghanis despite what is propagated in the mainstream media. The picture is far from rosy and the cycle of violence continues. Fadi: Khaled Al Husseini saw a huge success telling the stories of Afghani people and the effect of the cold war and the soviet invasion of his country on their lives. I am happy to see someone else tackling the effect of that war on the lives of people in the region and the world at large. This is an important story that needs to be told. Where did the idea of this book come from? What motivated you to tell this story? Fadia: When I heard that a young man from our neighbourhood in Amman ‘achieved martyrdom’ in Afghanistan in 1987 my fourth novel began germinating. I was puzzled by this piece of news. Why would a young man from Jordan travel all the way to Afghanistan to fight somebody else’s war? How could he leave his family and country behind and travel with the Taliban from one province to another, looking for Soviets and their supports? What happens to your loved ones when you prioritize the call to jihad, holy war, over them? What about their women relatives who are left to fend for themselves, earn a living, and keep the household together? Their perspectives were mostly missing in everything I had heard or read. More over the ramifications of the events in Afghanistan are far and wide. Difficult questions needed to be asked about the state of the world today and the only way you could tackle complex issues is through fiction. Fadi: In my dissertation for the MA in Creative and Critical writing, I did a psychoanalysis read for the relationship between the father and the son in “The Kite Runner”. I was mainly interested in the effect of the father figure on the death drive of the son. For my creative piece, I reflected that into a relationship between a mother and her daughter. 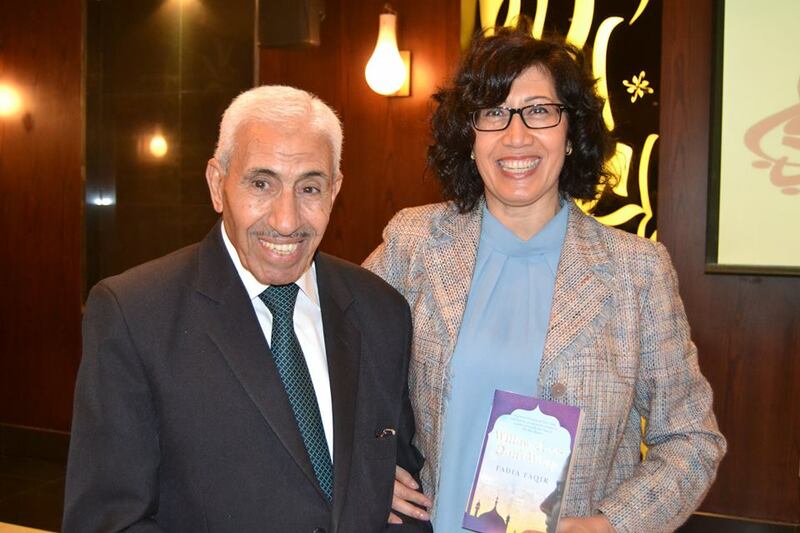 I could read the same in your book: Najwa has a strong mother’s figure that is doubled by her grandmother. I could see how these figures along with her concern about her identity fueled her journey into dangerous Afghanistan to look for her father. At the end of the book, you kill the father figure and pave the way for Najwa’s healing. Did you have this psychoanalysis dimension in mind while writing the story? Fadia: No, I didn’t. This must have evolved unconsciously. There is a line I read somewhere, ‘Father die so I could be free to love you.’ And I wanted some of that in the novel. He does not literally die, but the myth of him does. So Najwa, like most of my heroines, manages to position herself within the historical web of events, and actualizes herself at the end of Willow Trees Don’t Weep. Like most of my novels it is a rite of passage and a narrative of initiation. Physical journeys from one country and continent to another are intertwined with internal ones. The odyssey humanizes and leads towards compassion for self and others and ultimately forgiveness. Fadi: I enjoyed reading in particular about Najwa’s mother. Though she sounded depressed, but also showed a strong character. It needs courage for a Jordanian woman to stand firm and admit that she is not a believer. The character has even gone beyond that into showing disgust and strong rejection of anything that is related to religion (partly due to her husband disappearance for his religious cause). I am sure that there are many Jordanian women who could relate to this character. I know that even showing such women exist needs courage. Where you reluctant in writing her this way? Fadia: No. There had to be a wide spectrum of characters in a novel that is partly about faith and the intra dialogue between Muslims themselves, which you rarely see represented in the mainstream media. The fundamentalists, true and moderate believers, seculars and the non-believers interact and debate issues. Najwa says that she is caught between her father’s magic, ie belief, and her mother’s science, ie secularism. She has to navigate a way through all of this and forge her own ethical code. 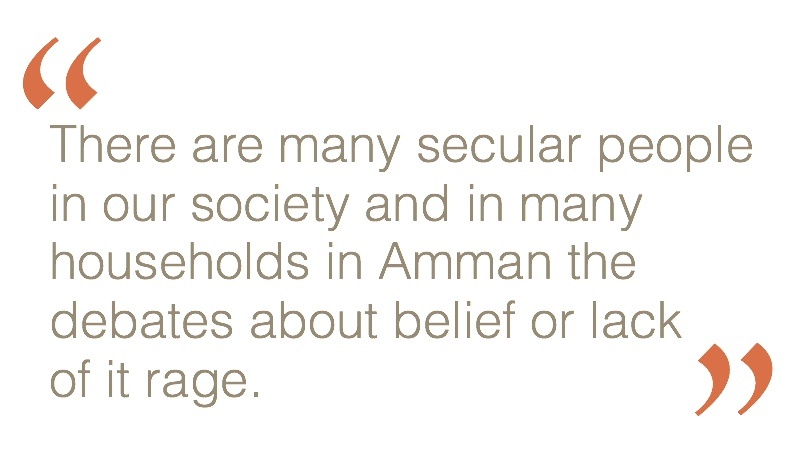 There are many secular people in our society and in many households in Amman the debates about belief or lack of it rage. This had to be aired. Give voice to the voiceless if you have a pen and can use it as you weave aesthetically pleasing fiction. Fadi: In all of your books, you show concern in women status in Jordan. Gender equality activism is not new in Jordan, much work has been put into this but yet things are not moving forward the way we aspire to see. We have seen good success in education where women makes more than half the graduates but we are yet to see this translated into economic participation and civil rights. What do you think is wrong? How can we tackle these issues? Fadia: Jordanian society is male-dominated and had been for a long time. To tip the power in women’s favour requires social, legal, political etc. revolutions. This will take time and effort. The economic variable is so important, but women shy away from discussing property, earnings, inheritance with their partners and family members. 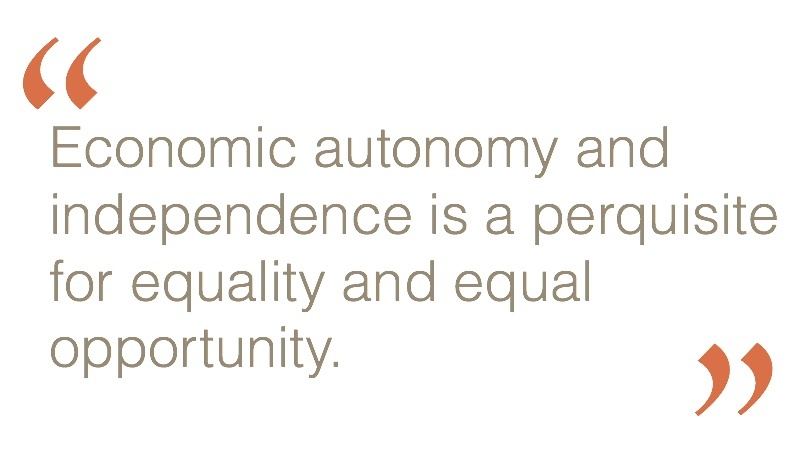 Economic autonomy and independence is a perquisite for equality and equal opportunity. Oddly enough in some cases in Jordan, where domestic violence is rife, it is not leading to liberation. Male members of the family confiscate the earrings or women. However, education and economic independence are a must and then other things would follow. The ceiling in Jordan is made of fire-proof glass and women need to keep chipping at it to break it. And every step towards gender equality taken by any woman anywhere in Jordan will push the boundaries farther. The personal is political and is our starting point. One more observation: women themselves are mostly divided and do not support each other. In Britain things began to change when ‘The Old Girls’ Network’ was born and women began organizing themselves and truly supporting each other. Fadi: It is a beautiful relationship you built between Najwa and her father, especially towards the end of the book where many things gets revealed. You dedicate the book to your own father Ahmad al-Faqir. It is a touching gesture. As they say there is a woman behind every great man, but I also think that there is also a loving father behind every great woman. How did he shape the woman you are today? What influence did he have on your character and literary career? Fadia: My father taught me how to read and how to read between the lines for I rarely saw him without a book in his hands. He encouraged me to study history and emphasized the importance of understanding its movement in it’s totally and explained how events are interconnected. We disagree on some things, but our conversation never stopped. His pursuit of freedom and justice inspired my writings, although our world visions are different. Despite the fact that he sometimes disagreed with my choices he stood by me through thick and thin and never stopped loving me or I him. Fadi: There is a good part of the book that talks about Afghanistan war with detailed scenes from battles ground. I assume that required much research from your side. Does living in the UK make it easier for you to access that information? When talking about historical incidents, do you think that Arabic authors are in disadvantage here in terms of the breadth of information they can access? Fadia: A colossal amount of research went into the novel, but the reader is supposed to only see the tip of the iceberg. Since it began germinating in 1987 I hadn’t stopped searching for information. I collected material, watched documentaries, and monitored the press for twenty-seven years. My interest in the Afghanistan, its people, and the invasion is like a program that is always running in the background of the PC of my mind, an obsession, if you like. Unlike some Arab authors access to books here in the UK is easy and their price is normally reasonable especially if you buy them secondhand. 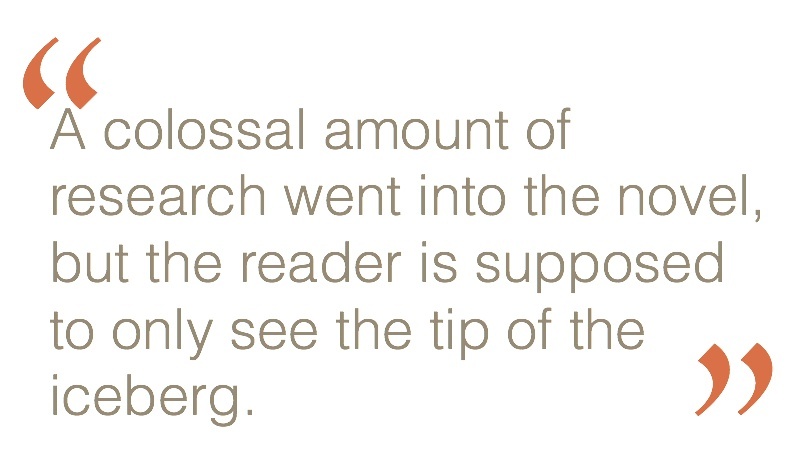 So yes some Arab authors who don’t have the facts at their fingertips are at a disadvantage. But the internet is changing all of that if you they have an unhindered and uncensored access to it. Fadi: Do you have plans to translate “Willow Tree Don’t Weep” to Arabic? Fadia: As you know I don’t translate my books although I oversee closely my translations into Arabic. I worked really hard on the translation of My Name is Salma because it was the first time my writing appeared in Arabic and it had to be perfect. It isn’t, but the Arabic text is close enough to the original. 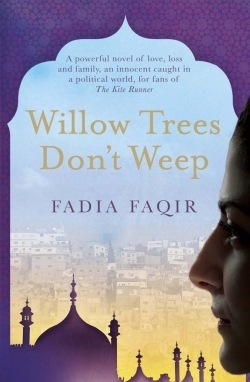 I do hope that Willow Trees Don’t Weep will catch the eye of an Arab publisher soon. Fadi: Why did you choose to write this one in English? Fadia: After writing in English for thirty-one years it has become as Conrad said, ‘a capability’. These days I wake up and write in whatever language comes first and English is normally my morning visitor. I am not sure after living outside Jordan all these years my Arabic would be good enough to draw the kind of world my fiction conveys. Funnily enough social networks have improved my Arabic and widened my contact with the Arab world. I am also planning to partly move to Amman. So watch this space. Fadi: How do you see the state of the Arab world today? I feel that we hit a rock bottom with terrorism and that we are yet to see a u-turn. People today are more aware of the dangers that comes from religious extremism. Do you feel a positive change is anywhere in the near future? Fadia: Unfortunately I don’t envisage a positive change soon and because of that I am suffering from post-Arab Spring depression. Its symptoms: silence, self-examination and searching for ways forward. 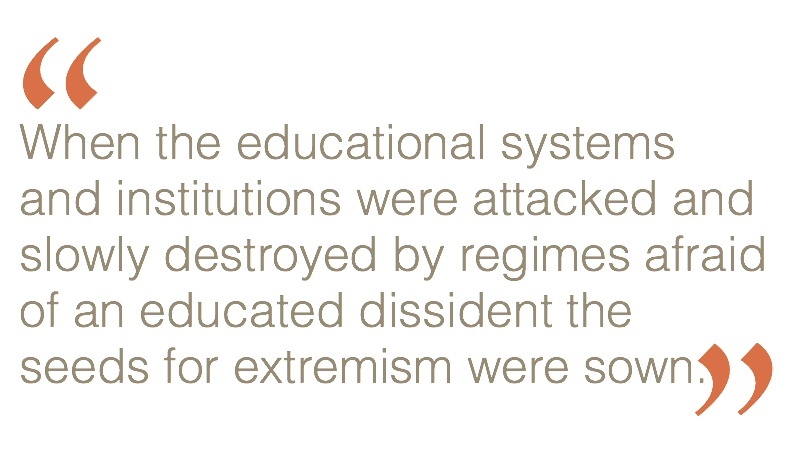 When the educational systems and institutions were attacked and slowly destroyed by regimes afraid of an educated dissident the seeds for extremism were sown. Katatib and religious schools, where mostly Wahabi dogma is taught, began spreading. And the elite bear some of the responsibility for that because difficult questions about religion and its relation to politics were either dodged or never discussed openly. For true enlightenment to take place intellectuals must apply reason and discuss the role of traditional institutions in society openly. But alas that pivotal moment had passed. So the damage is done and it’s going to take a long time and much effort to reverse the tide in the Arab World towards liberal, democratic and tolerant societies. Fadi: Have you started working on your next book? Fadia: Yes, and the working title is ‘Catherine and Omar’. The second draft is almost finished, but it requires a few edits. A female British archeologist arrives in Jordan and joins an excavation in Petra. This cross-cultural encounter proves to be life-changing for her and some people around her. It is supposed to be a romantic comedy, but there isn’t much laughter in me these days because of the events in our region. Fadi: What do you advise young Jordanian ambitious writers? Fadia: I recently stayed in Amman for a while and I could see how much it has changed. East Amman, where native Jordanians, immigrants, asylum seekers jostle for work and live side by side, is in a state of flux. This miasmic shift needs young writers, like you, to chronicle it. Indian and Latin American fiction comes to mind. And I am looking forward to reading something similar to Mohsin Hamid’s How to Get Filthy Rich in Rising Asia in Arabic and with a clear Jordanian flavor. Also it will be great if a Jordanian literary agency is established to represent, defend and promote local writers. If I were younger I would look carefully at self-publishing on the internet. Digital books opened up possibilities for authors everywhere and Jordanian ones are no exception. It is hard at the beginning but if you establish a cyber footprint you will be in charge of your own brand, earnings and future. To conclude the closer a writer moves to him/herself and their own voice the more international they become. This journey towards self, distinct style, and unique vision is life-long and arduous, but the rewards are many. Some readers prefer authentic and sincere narratives with a distinct cultural flavor and Jordan is a fertile ground for that kind of writing. Fadi: Thank you Fadia, as you said, we have many stories that deserve to be told, and have Jordanian talents that are up to bring these stories to life. Keep on impressing us.